The guineafowl (sometimes called guineahen) are a family of birds in the same order as the pheasants, turkeys and other game birds. They are also widely known as guineahens, (a term formerly applied to the turkey). The American Ornithologists' Union includes guineafowl (Numididae) as a subfamily of Phasianidae. This is a family of African, insect and seed-eating, ground-nesting birds resembling partridges, but with featherless heads and spangled grey plumage. At least three of the species are poorly studied. The species for which the information is known are normally monogamous, mating for life. 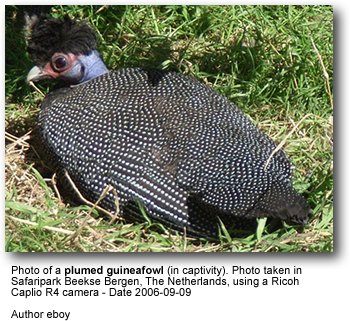 However, occasional bigamy has been recorded for the Helmeted Guineafowl (Madge and McGowan, p345-352). They are large birds which measure from 40-71 cm in length, and weigh 700-1600 g.
The Helmeted Guineafowl has been domesticated and introduced outside its natural range, for example in southern France and the West Indies. 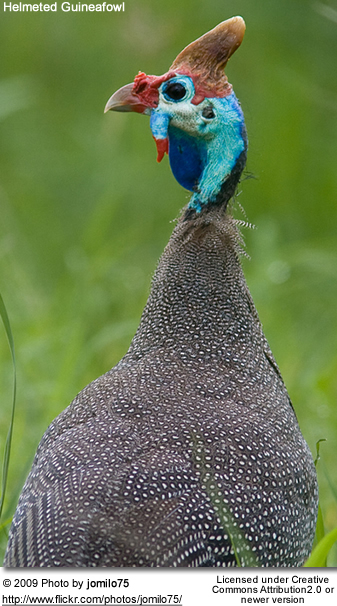 Guineafowl have a long history of domestication, mainly involving the Helmeted Guineafowl. The young, called "keets" are very small at birth. In fact, 30 can fit into a shoebox at a young age. The keets are kept in a box inside the house until about 2-4 weeks of age, before being moved into a henhouse. They eat lice, worms, ants, spiders, weeds, ticks, etc.